This month’s second eclipse is a penumbral lunar eclipse (9:46 AM EST) that activates approximately 7 degrees of Gemini (the Moon’s position) and 7 degrees of Sagittarius (The Sun’s position). It lasts a little over 4 ½ hours, which means will radiate its influence over the next 4 ½ months. When planets pass over sensitive eclipse points, the energies of that eclipse can also be triggered over the next few months. It’s important to remember that Eclipses are part of a (very) long-term cycle, so we have to look at them as a continuous energy release, rather than a “blip” or blast of energy that we freaks us out for a day! For instance, this eclipse is part of Saros Series 145, which “began” way back in August 1832. A lunar eclipse generally occurs twice a year, and it’s always a Full Moon. The Sun, Moon, and Earth line up, with the Earth playing “monkey in the middle” between the Sun and the Moon, which are in opposition. The opposition is a relationship aspect which forces us to come to terms with the “other”. What we don’t deal with in our inner world will often manifest in the outer world as a block or something standing in our way. We need to learn to integrate the energies represented by the two planets in the opposition aspect. Until we synchronize the energies, we may swing wildly back and forth between the two poles. All eclipses usher in change, they energize and rearrange; lunar eclipses often act like karma cleansers, blasting away the past and taking out the psychic trash, which is, of course, unsettling. You have to look at it as necessary housekeeping. I was going through some clothes recently, since I kept buying new things without sorting through the old. As the inevitable result, I had a pile-up of “stuff” and not enough closet space. I dragged the old clothes out and quickly realized that a) I had things I didn’t even remember buying; b) Some things will never fit me in this life OR in any of my next incarnations; c) Yes, there are colors/styles that do look bad on everyone; d) I liked some things very much but they had outlived their due date; or e) Someone else must have bought this atrocious garment; my taste isn’t THAT bad, really. This led to f) Get rid of/recycle all things scrutinized in steps a-e.
After doing that, I had more space available so if I found something new that actually fit and looked good on me, I’d have room for it, rather than keeping piles of things around that don’t serve much purpose anymore. Eclipses are about giving yourself uncluttered space to move around in. Since we all want to hang on to our old crap, this is often a scary prospect! To figure out what areas need a good scrubbing, take a look at around 7 degrees Gemini and 7 Sagittarius in your chart and see what house of the chart they fall in. You’ll see a lot of activity in that area; things may be in flux or something may end or disappear. If you’re going in the wrong direction, you may find yourself realigned by forces seemingly beyond your control. Gemini and Sagittarius are mutable signs, tending to be flexible and adaptable, with the ability to respond to fluctuating conditions. They’re outer-directed, “masculine” signs who push energy outward to connect and communicate with others. There’s a certain restlessness here, a need to be on the move, physically, mentally, or emotionally. Sometimes it’s hard to pin them down and there can be a certain nervous tension if they;re overloaded by all the external input (which they nonetheless crave). The Moon in Gemini is conjunct Jupiter (ruler of Sagittarius), further emphasizing the connection between these opposite signs and indicating we’re going to have to learn to integrate the energies. There’s a lot of teaching going on, and a lot of learning, often at the same time. We may find that the ideas we’re emotionally attached to, and our belief systems, need to be expanded and enlarged. Trickster types may abound, snake-oil salesman may pop up around every corner (Moon/Jupiter in Gemini can expand everything, including lies and exaggerations and the Moon is also square to Neptune in Pisces). This eclipse may expose some of our most cherished illusions and delusions. We’ll also need to detach from our attachment to being right or thinking we’re the cleverest one in the room. Polarization can occur as everyone believes their truth is the only truth, and excessive religious zealotry or self-righteousness can block day-to-day progress. People can get very worked up if they feel their views are being challenged. Watch for ways in which you’re mirroring others (and vice versa)–what do you see in that mirror? The Moon is also conjunct Lilith and is at the focal point of a chart formation called a Yod. A Yod features two planets in a sextile (60 degree angle) plus a third in a quincunx (150 degree angle). The base of this one features Venus and Saturn together, sextiling Mars and Pluto together, with the Moon/Jupiter/Lilith lineup as the apex, and the Sun in Sagittarius opposing that Moon. Yods tend to create a lot of tension in order to transform. In mythology, Lilith was Adam’s first wife. She was the one who wouldn’t obey him, who represents raw, liberated female energy and sexuality. Since Venus/Saturn and Mars/Pluto are also involved in this Yod, issues relating to female sexuality (and control thereof) vs. religious authorities and groups are likely to boil over. We’ve already seen some of this rear its head right before the U.S. Presidential election. A great deal of adjustment is necessary in order to properly integrate these energies, and Yods also tend to up the intensity quotient. They’re also called the “Finger of God” formation, and with Moon/Jupiter /Lilith in the hot seat, sparring with the other heavy hitters who form a part of this Yod, we may find that we can’t keep what we know a secret any more. The Yod, based on the quincunx aspect, is also related to issues of health, work, and healing (6th house concerns). Many people have been experiencing the feeling that “something has to give” and this is what Yod energy feels like. This Yod also highlights relationships, how they come together and how they fall apart. Again, secrets will come out. If you’ve been living a double life or have been hypocritical, don’t expect that it’s going to be “business as usual”. There’s a bit of the avenging angel in this tangle of planetary connections. And I’m not even going into the fixed star connections here! I just got Diana Rosenberg’s books on the fixed stars, Secrets of the Ancient Skies, and noted that this eclipse has connections with the Hyades group and the fixed star Algol, which essentially bring in elements of danger, violence, mass events (especially large scale weather events) and upheavals, plus general mayhem and chaos. There’s really a wild and unbridled element here, even as we try to keep it all under wraps. The genie is coming out of the bottle and who knows what will ensue? In addition to this Yod, Chiron in Pisces forms a T-Square with the Sun in Sagittarius, which opposes the Gemini Moon. Uranus in Aries trines the Sagittarius Sun and sextiles the Gemini Moon. Mercury, ruler of Gemini, is now in Scorpio and is one of the few planets not really aspecting anything major. The entire chart configuration is a Locomotive with Saturn as the focal point. The key point, after trying to make sense of this tangled mass of aspects whirring around in the eclipse chart, is that there’s tremendous energy available for change. It can be used constructively (the locomotive is a powerhouse, Saturn in Scorpio tells us our karma is to do the work we’re here to do) if we don’t fall into the trap of lying to ourselves, abusing our power, or denying who we are and what we really need to do in order to fulfill our destiny. Note: Those of you with planets or chart points at around 7 degrees of the mutable signs (Gemini, Sagittarius, Virgo and Pisces) may find that this eclipse really “hits you where you live”. You may find some of the themes discussed above active in your life at this time. Keyword for the Sabian Symbol for the Moon is: ”Recompense”. 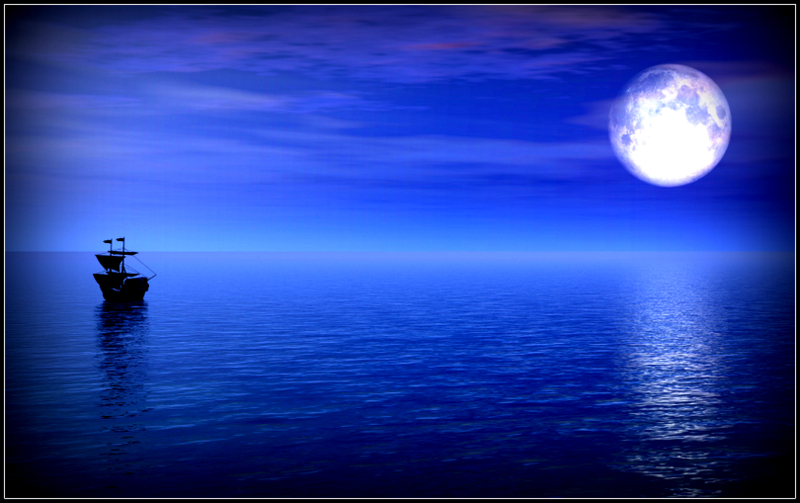 Keyword for the Kozminsky Symbol for the Moon is: ”Calmness”. Our Kozminsky eclipse symbols both contain ships in calm seas, but one features a dark and starless night with an ominous raven hovering, while the other floats along by the light of a silvery (full) moon. These dovetail nicely with our eclipse themes (particularly that full moon reference), and echo the duality of dark and light, inner peace vs. a feeling of foreboding, choosing to move forward in a measured pattern towards the light vs. sitting still in the dark enveloped in an aura of emanating gloom. This eclipse will illuminate areas which may have been “in the dark” or open up Pandora’s box of primal emotions. How we react will determine our trajectory. The Sabian Symbols relate to discovering what sustains and fulfills you and the importance of opening the door to it. Be available and ready to share and you’ll find contentment. Both Symbols contain an opportunity, one to slake your thirst, the other to fulfill another kind of thirst. Primal needs are primal needs, no? Both are an invitation, an opening that can lead to fulfillment. Choose what nourishes you; be ready for any opportunity that presents itself and make adjustments if necessary. Remember not to give up too much by becoming overly absorbed in whatever or whoever attracts you, as this can lead to unhealthy obsession and loss of boundaries. Manuel Komnenos (Greek Byzantine Emperor), Margaret Tudor (wife of James IV of Scotland), Pietro Sforza (Italian theologist), Betty Paris (accuser in Salem witch trials), John Bunyan (cleric, author of “Pilgrim’s Progress”), John Palfijn (Flemish physician, inventor of forceps), Edward Hyde (British governor of New York and New Jersey ), Sophia Magdden of Brandenberg-Kulbach (Queen of Denmark and Norway), Maximilian II Jozsef, King of Bayern, John Wesley Hyatt (inventor of celluloid), Helen Magill White (1st American woman to earn a PhD), Alfonso XII, King of Spain, Stefan Zweig (poet, dramatist), Ernst Rohm (Nazi leader, SA), Jose Iturbi (Spanish pianist), Victor Jory (actor), Nancy Mitford (author), Albert Moravia (author), Claude Levi Strauss (French anthropologist), Morris Louis (post-abstract painter), Lilian Baels (2nd wife of Belgian King Leopold II), Gloria Grahame (actor), Cecilia Colledge (Olympic figure skater), Arthur Okun (economist), Hope Lange (actor), Ethel L. Ennis (orchestra leader, jazz singer), Prince Hitachi (Japanese royalty), Gary Hart (scandal-plagued Democratic senator), Laura Antonelli (actor), R.B. Greaves (singer), Timothy Krajcir (serial killer), Joe Dante (film director), Victor Ostrovsky (Mossad agent), Kristine Arnold (singer, Sweethearts of the Rodeo), Georges Rataganda (Rwandan war criminal), Matt Cameron (musician, Soundgarden), Cornelia Guest (debutante), Fenriz (musician, Darkthrone), Sigard Wongraven (musician, Satyricon), Mary Elizabeth Winstead (actor), Dawn Robinson (singer, En Vogue), Patty Zomer (singer, Dolly Dots), Agnieszka Holland (film director), Clem Curtis (singer, Foundations), Michael Ritchie (director), Ben Bova (science fiction writer), Helen Kinney Copley (newspaper publisher), Shy’m (French singer), John Galliano (fashion designer, Dior), Jean Charles de Castelbajac (fashion designer), Gato Barbieri (jazz tenor saxophonist), rita Mae Brown (writer, screenwriter), Barbara Morgan (teacher/astronaut), Trey Songz (R&B singer), Jon Stewart (comedian, “The Daily Show”), Judd Nelson (“Brat Pack” actor), Ed Harris (actor), Anna Nicole Smith (model, reality TV show), S. Epatha Merkerson (actor, “Law & Order”), Paul Shaffer (bandleader for David Letterman Show), Randy Newman (singer/songwriter), Berry Gordy Jr. (head of Motown Records), Brooks Atkinson (New York Times theater critic), William Blake (poet/illustrator), Alexander Godunov (ballet dancer, actor), Friedrich Engels (sociopolitical theorist, Marxism), Alfonso Cuaron (film director). Today I asked for some additional information about the long-term effects of today’s eclipse. Both cards in this combination are Pentacles, earth cards, so this tells me that today’s eclipse is part of a pattern that involves tangible changes, things we can see, feel, and hear. There may be a “bottom line” impact that will affect our daily lives, our habits, rituals and routines, and financial circumstances. With the Queen of Pentacles as a Taurus card and the 5, the 5th month, May, in the time of Taurus, may be when we feel the full effects of this eclipse. I’m also wondering if the Taurus Queen of England, Elizabeth (E = 5) and her lineage may be hit hard by this eclipse. I also see this combination as indicating earth changes (5 is change, Queen of Pentacles as “Mother Earth”) such as earthquakes, which force alterations in our patterns of daily living. These two cards also tell us it’s time to “go freelance” with our talents, to learn to value ourselves and what we have to offer. Times of change provide us with opportunity to break out of our ruts, even though at first we have to navigate a chaotic phase . Serious issues of self-worth and how we undermine ourselves may come to the fore during this period. Physical problems may emerge–many of us need to take better care of ourselves. This is a “work smart” combination, and we must learn to streamline the way we function in order to get things moving to avoid being stuck in non-productive modes. Nurturing, food and food distribution, how to feed the world’s people (especially if climate change alters rainfall patterns or renders some areas unsuitable for farming). This pair could also relate to serious depletion of the earth’s resources and a period of scarcity that we’ve brought upon ourselves through waste, misallocation and a failure to appreciate the gifts that have been given to us.